One of the common problems with bringing your baby outside is having to change his diapers when it’s full or when he poops. I’ve rarely encountered a place let alone a mall which has a good changing area for babies. More often than not, the changing area in the restroom is rarely cleaned. Hence, we’ve constantly just resorted to having to change Warren outside on a flat surface or looking for an area with a flat surface. It was such a relief to have found the Ah Goo Plush Pad product. It is comfortable enough for both permanent and portable use. It incorporates a lush memory foam cushion which provides superior comfort and support for babies for on-the-go parents like me. The Plush Pad® is soft, warm, water-repellent and machine washable! It comes in other cool and fashionable designs. This is what we got for Warren. 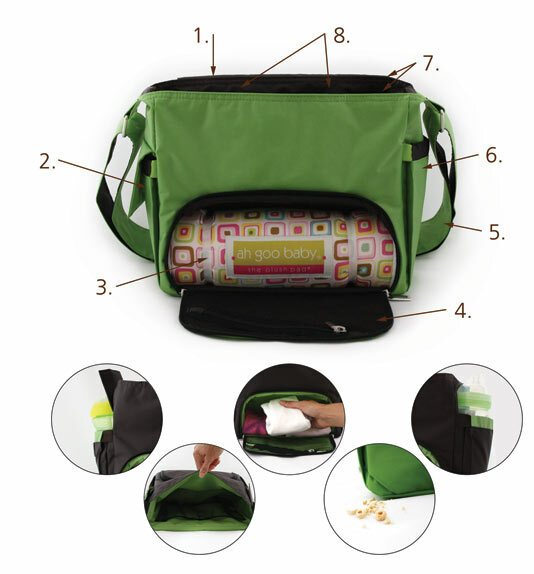 The Ah Goo Plush pad can easily roll and fit into any diaper bag but I found this super cool diaper bag below. It’s super light and the compartments are all well though of. The Ah Goo Plush Pad and Ah Goo Diaper bags are available in our Multiply store.